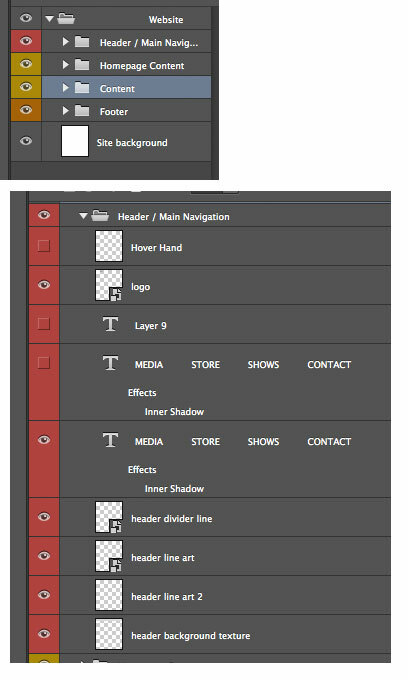 Reasons for good photoshop etiquette: when you’re on a team, or a big project, keeping organized and having consistent conventions makes everything easier. When you pass off your files to someone else, it’s great for them to be able to dive into it right away without having to ask you questions about where (and what) everything is. I didn’t know this: you can make smart objects out of layers you have in photoshop. That means that they are all linked to each other, so one change changes them all. This is great for things like buttons, things that need to be uniform across the site. Chris says “scalable vector graphics” and the class goes dead silent. An awe blankets the crowd. Chris continues demonstrating an .svg button in the browser vs. a .png. With resizing the image in the browser, the .png reveals it’s pixels, but the gradients on the illustrator button says smooth. So smooth. The class applauds. The neatest trick we’ve seen all week. Use adobe Illustrator to make buttons. Save as .svg (Scalable Vector Graphics – Wikipedia, the free encyclopedia.). That’s one thing about web design. You have to keep on top of knowing what the features of updated software can do for you. Chris is going to talk about how we’re going to use InDesign next week for the extra oomph. We can use Adobe digital publishing to create html! So excited.